Presentation is one of the most important aspects of fly fishing. To be able to trick a fish into eating your fly, you need to know the best strategies and equipment to execute it. Denny started out as a guide in the Klamath Lake in Oregon for several years. At present, he guides and fishes over 250 days a year out of Forth Klamath where he owns the Crystal Creek Angler. He has Stillwater schools and clinics that take him to sites around the country and Canada. Denny is also a regular on the Outdoor Show Circuit and his flies received wide-acclaimed including Outdoor Magazines and Cushners Fly Fishing Museum. He has also hosted Fly Fish Magazine on OLN TV and a Cortland Pro Staff. and he helped Diamondback Rods design a rod specifically for stillwaters. 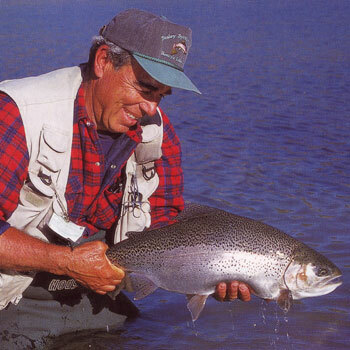 His books include Fly Fishing Stillwaters for Trophy Trout, Tying Stillwater Patterns for Trophy Trout, and Fly Fishing the West’s Best Trophy Lakes along with his most recent edition which is called Stillwater Presentation. Presentation is everything an angler does both in preparations before they get on the water as well as executing their skills when they are on the water. The most important part of the presentation, which a lot of anglers don’t know, comes down to the fly line. It is not actually about the flies or what they do with them, but adjusting to what Mother Nature is doing. One of the most critical parts is picking the right fly line for the conditions that exist when the angler hits the water. The rod is not that critical anymore compared to the reel when fishing stillwaters. Whatever rod an angler prefers is fine. It is not necessary to use longer rods. If they build their line in speed casting, when they are practicing, and they are by the grass or a swimming pool, they just have to get down on their knees and see if they can cast the line and keep it from hitting front and back. There is no advantage in casting upwind. If there are insects on the surface and they are being blown across the top, trout almost always face into a wind. What the angler should do is to cast across the wind, which requires a rod that is going to cut through the wind on a windy day. The profile of the fly means that the fish sees its head, the tail, the body, the color, the movement and everything. If an angler casts downwind with the fish facing him, he is only lining fish. Any fish feeding close to the surface will spook them. If the angler pulls the fly up through a zone that didn’t have any fish, he may think that the fish are just not eating. In fact, the real problem is the presentation – it has nothing to do with the fly. The line is the most critical part of stillwater presentation. Fish feed shallow, they don’t feed deep. They rest deep. When a fish goes into shallow water to feed such as in the shoreline edges or close to the surface, anglers will need a line that will put their fly in that zone and not drop it below the level of the fish. Trout do not drop or take anything that slips below them. They feed at their level or above, so in any presentation, the challenge is to keep that fly above. Lines are so critical because of the sink rate. A lot of lines are being masqueraded out on the market today that says intermediate on them, but are made with a mono core which sinks twice as fast. The implication of this is when anglers will cast and they are not staying at or above that level, the lines will drop below the fish and they won’t tip to eat. Early and late in the day is the best time to fish. This is the time when the big fish will cruise and a lot of fish will want to feed. Anytime the sun gets lower, fish feel safer, so they are going to come out to feed because they know they can feed without the worry of predators. As the sun gets higher, they lose their cover of darkness so they drop off into deeper water. When the fly enters the water, the only time color is going to be pertinent is when the sun is shining. When flies are dropped in the water at night, fish only see silhouette. They do not interpret color. What they see when a fly is put in front of them is going to be something that has to look like food. If it doesn’t look like food, the fish won’t go near it. The color of the fly should only be considered when the light is out. In this case, burnt orange is very critical. When a fish sees a fly and he thinks it is food, he is going to eat it. He doesn’t question what it looks like or what color it is. If he questions it and he comes in for a closer look, then that is the time that color and movement becomes the most important thing. One tip to remember in fly fishing is to start early – all the big fish that you want to catch will be cruising shorelines at first light. The second thing is that after the sun gets higher, fish are going to move and they are going to move often to deeper water unless there is some kind of such as weeds, edges, down trees or anything that they can use to seclude themselves instead of going deep. However, they are more comfortable in deep water since it is cooler and it gives them the oxygen that they want. The feeding zone in all lakes is always the top 5 feet from the shoreline down to about 5 feet. Once they are deeper than that, they are off the bite. If they are not on the feeding zone and they dropped down, it is good to switch into a 10-foot sink tip. All in all the conditions that fish are under are the most important in terms of making choices on lines, patterns and retrieves, as well as where the angler fishes and what depth they pull the fish. Listen to our full show with Denny Rickards and learn more about tips, tricks, and strategies in Stillwater Presentation. If you have any further questions about stillwater fly fishing feel free to call Denny directly at 541-381-2218.